How to add security password to flipbook? After I publish the flipbook online, I don't want my books to be read by others except those who have access right granted by me. You can add security password to your flipbook so as to prevent unauthorized access. In this way, only those who have been granted can open and read your book. In addition, you can set a page range to protect some pages from being viewed. Start A-PDF Flip Book Maker and import a PDF file. Then in the main interface, click the "Design Setting" tab, and you can find "Security Settings" under "Flash Control Settings". 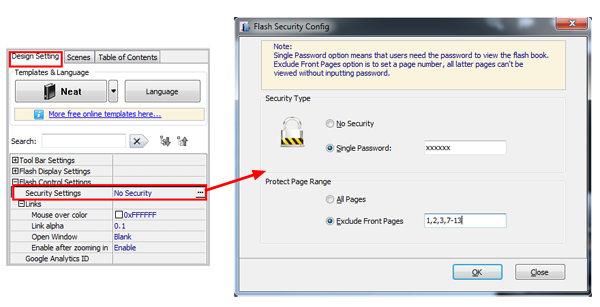 Click the square and you will see the pop-up Flash Security Settings dialog. Now you can input the password and choose the pages you want to protect.